Imagine the high bar of writing and creating a beloved show’s finale. I remember the unbelievable hoopla surrounding the last episode of Seinfeld, say, only to have that episode, with the four main characters winding up in jail for being such assholes, leave us with an example of an extremely tone-deaf way to wrap up a series. At the other end of the spectrum, we have the tearjerking moment of Hawkeye taking off in a chopper, viewing the goodbye that Hunnicutt left for him. Mary and the WJM-TV news crew getting fired. Sam Malone turning off the lights at the bar for the last time. Not saying that “Bon Voyage” is of that caliber exactly, but as series finales go, it’s pretty great. The revival came back because of the Palladinos’ unresolved feelings over that final season, and I did enjoy it, but honestly, I didn’t have any lingering resentment (except for one moment, noted below) after the last episode of Gilmore Girls’ season seven. It ended as it began, which is to say, almost perfectly. Before we get there, though, let’s plow through Rory’s graduation and marriage proposal, pretty much a housekeeping episode to wrap everything up before the finale. Lorelai and (ugh) Christopher are at peace. Paris and Doyle are off to India, with not a word from Rory about how much Paris’ friendship has meant to her, only the other way around. Richard and Emily’s song was adorable. And Logan, in an ill-advised move, decides to propose to Rory at her graduation party. They’ve been dating for three years, right? So how could Logan spring something like this on her, knowing her usual slow decision-making process, which usually includes a lot of pro and con lists? I actually believe that the proposal was a plot device to get Logan out of the picture to leave Rory’s future unbridled. (Love Lorelai and Rory taking a ride in that romantic carriage instead.) So long, Logan. See you in London. You know I love Emily Gilmore, but she’s pretty unbearable these two episodes, furious that Rory isn’t going to jump at such a solid proposal right out of school, the way she did. In both instances, it’s Richard who saves the day, by pointing out that Rory’s graduation is a celebration of Lorelai as well, and encouraging her to take her well-deserved moment. We even get our last few moments of Stars Hollow quirk, as Kirk hangs in a box, David Blaine-like, over Luke and Lorelai quarreling about Logan’s proposal, which is really about them. As with Rory and Logan, it was the marriage part that messed them up, not the relationship part. But Rory’s right not to cut off all of her other options at only 22, and Logan takes the ring (where did Rory have the ring stashed anyway? In her graduation cap?) and strides off into the sunset, to Emily’s certain consternation. Again, when you’re saying goodbye to a series, it’s nice to work that goodbye into the actual characters. That’s why those M*A*S*H and MTM finales work so well, because we know the characters (and the actors) are as torn up as we are. So I’m willing to accept the fact that the entire town is going to roll out to say goodbye to Rory Gilmore. And, like Richard points out again, in another tear-jerking moment, the party is for Lorelai as well. She created this new life for herself when she was only a teenager, and it turned out amazing, after all. Emily is again cranky this episode, complaining about the short notice of the party, but I think she’s just reacting. She’s the one who realized that this was the final Friday-night dinner with all four of them, and the wordless despair that then hung over the table was extraordinary, because it was the last Friday night dinner for all of us. And the relief on Emilys face when Lorelai says she’ll still come to dinner (and Lorelai’s tiny smile when she realizes that Emily’s spa efforts are just an attempt to keep those dinner going) is just lovely. We end the series knowing that the Gilmore ties are as strong as ever. Other than Rory getting a job covering Barack Obama, the big news of the finale is the reunion of Lorelai and Luke, and I have to say, it’s a too-short moment that has always bothered. me. I do like the way Lorelai says “Luke” with about 1,000 “I love you”s steeped in there, realizing that he may not be the best with big talk or romantic gestures like Valentine’s Day presents, but he cares about her more than anyone else in the world. He wants her to be happy, and will create a chuppah, an ice-skating rink, and a giant overnight tarp (still not sure how that played out exactly) to make that happen. But we’ve seen Luke and Lorelai kisses before, and for a reunion kiss, this one was pretty weak. Especially compared to the first one. And then, too quickly, we get that weird camera zoom above their heads to the party? What was that about? Eleven years later, it still bugs me. Parenting is the hardest job in the world, and just when it seems to be less hard, it’s over. 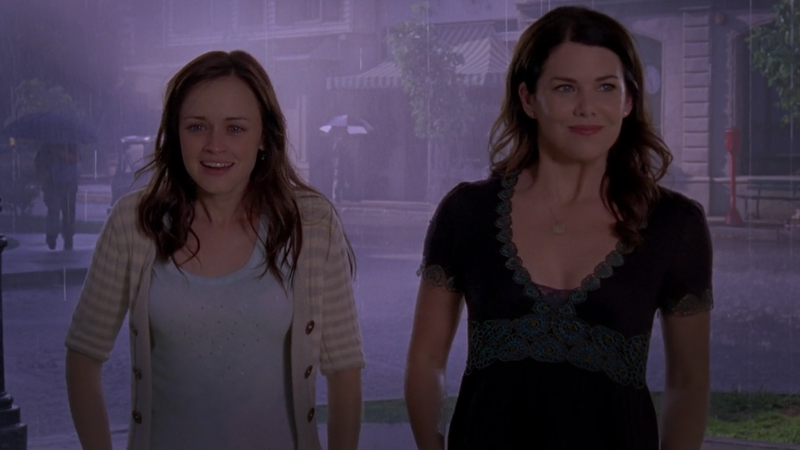 The nice part of the revival was that we got to see Rory and Lorelai hanging out and chattering again. But Rory’s statement, and even the girls’ final cute conversation, lets us know that no matter what happens, time and distance will never break the bond they’ve forged over a lifetime together. Y’know, maybe this finale deserves to stand among the all-time greats after all. Why does Lorelai not realize that her brushing off the karaoke as “it didn’t mean anything” is directly related to Luke blowing her off afterward? This week in Gilmore entitlement: For all Paris has done for you, Rory Gilmore, a little appreciation or a “you’re going to do great things too” would have been nice. You don’t have to be so startled by that hug, either. Final best Gilmore Girls outfit: I like Lorelai’s graphic red and black dress at the Christiane Amanpour meeting. Final worst Gilmore Girls outfits: The short sleeve hoodies and cardigans even make pretty Rory Gilmore look kinda dumpy. Her last-ever outfit, with the red blouse under the short-sleeve white sweater, is one of the worst things she’s ever worn. Worst-ever Gilmore Girls outfit: Still goes to Lorelai’s vest for Rory’s morning-after-jail breakfast in season five. Best-ever Gilmore Girls outfit: I didn’t get to review this episode (my all-time favorite) but my heart belongs to Lorelai’s vintage wear at the dance marathon in season three. Friends, please permit me this indulgence at the close of these 44 weeks and 88 episodes to tell you about the day I met the Gilmore Girls. It was my first day of my first Television Critics Association press tour, and I went straight from the airport that morning to the Beverly Hilton. Fortunately, I made it in time for the Gilmore Girls Netflix panel, which included both Palladinos, Scott Patterson, and the titular girls themselves. I’ve mentioned before that I started crying right there in the ballroom where the Golden Globes are, as I couldn’t believe that I was actually in the same room as these people from my favorite show. When I got TiVo, the very first show I put in my queue was Gilmore Girls, let’s put it that way. One last indulgence, I promise: Never say never, but this may be the last thing I ever write about Gilmore Girls. Just want to thank you so much for spending your Saturdays with me and reading. It meant the world to me to be able to write about this show and discuss with you all, even during the [shudder] Christopher era. Now I may have to go back to season one and start watching the series all over again. With my own kids this time.